Earlier this week it was leap year day. The very existence of such a day, the fudge factor day, is living testament that the mathematicians and astronomers who devised our modern calendar were unable to push and shove the complex and multi-factored movement of the universe into a completely static form. So they settled on just sticking in an extra day every four years to make things work. When my daughters were little we lived three houses down from Mr. and Mrs. Dragon. During the time we lived there Mrs. Dragon hosted a small neighborhood party on February 29th to celebrate eighty years of being alive and our family was invited. I remember how incredulous the girls were to realize that Mrs. Dragon had only experienced her “real” birthday twenty times! The concept of having to wait four years between birthdays, when for them waiting a whole year between birthdays required almost more patience than they could muster, was mind-boggling. There is something about leap year day that delights me. We live in a time when we have almost everything available to us all the time. Twelve months of the year I could choose to buy fresh tomatoes, basil and zucchini at the nearby Safeway. If I have a hankering to watch a particular televised program, even a rerun from years ago, it’s nothing special to find it somewhere on the internet. But February 29 is something special! It’s like finding some exotic plant that only blooms once every four years. And unless we are attuned to the plants rhythms, we’ll miss the blossoms and fragrance altogether. Leap Day reminds me that there are countless easily overlooked occurrences happening in their own rhythm all the time. My garden is a place governed by the rhythms of nature. I experience a sort of homecoming as my fingers ply the soil. By tending my vegetables and herbs I step into a quality of time that is impossible to fully calculate. 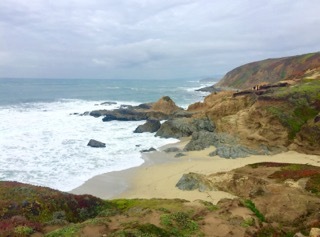 Some part of me finds ease and well being there. After just a few minutes the cultural bubble of intense frenetic energy disintegrates and I am content being there with the early spring spinach and the overwintered parsley. My garden also has an asparagus bed which until early winter was an overgrown tangle of tall fern-like foliage. When we bought the house the asparagus bed had been neglected. 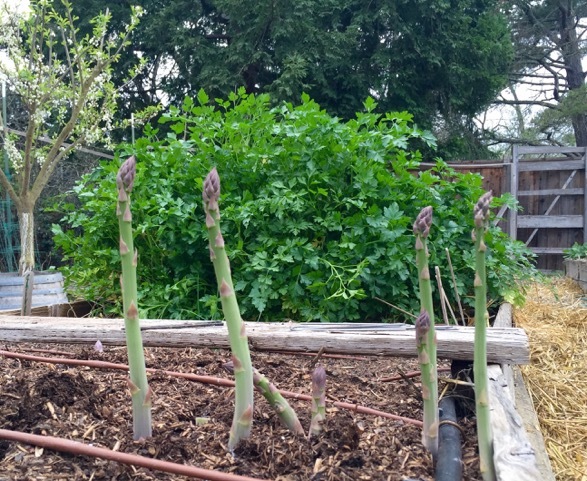 We learned that if we waited until the foliage turned yellow to cut the plants back to the ground, then applied soil amendment to the top layer of dirt, we could expect to have a bountiful asparagus harvest later on. And so, how serendipitous it was that on leap year morning we harvested our first spears of asparagus! A dozen spears had popped right out of the dirt, ready for the first cutting. And the taste was sublime. Even raw, they were the sweetest, crispest, juiciest asparagus I had ever tasted. Trimmed and sautéed in a little butter, mixed in with scrambled eggs garnished with a few springs of fresh picked tarragon and the asparagus was heavenly! What a wonderful way to celebrate leap day. The lesson from the asparagus was that it’s innate timing was in charge and sovereign, not the calendar or the caretaker. I was the one who had to pay attention and honor what was happening. We are back in regular time again. The month of March has arrived with its annual shape and duration. But what I really appreciate is that my asparagus teaches me to be true to my essential self, to keep things simple, be humble, and grow some food. If it requires a leap day to remember all this, so be it.